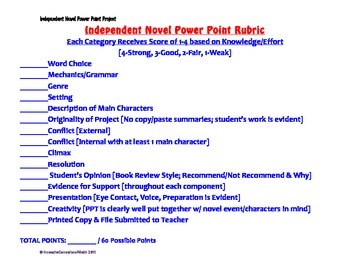 This easy guide/rubric is great for independent novel reading projects. Each nine weeks, my students create a project on a novel of choice that was chosen for reading outside of class. 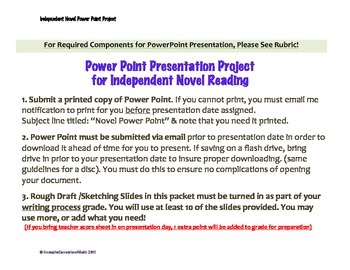 Usually during one nine weeks, I assign this power point project as the book project. In addition to the creation of a PPT, students present the book to the class and they gain more exposure/practice with speeches and oral presentations. 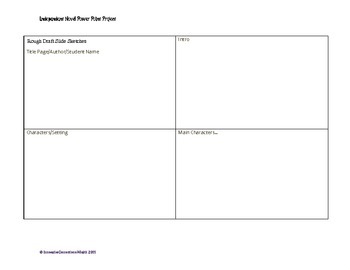 The presentation utilizes oral speaking skills, persuasion skills, and serves as a reading comprehension assessment. In addition, each project exposes classmates to another novel title, sparking interest in each student! 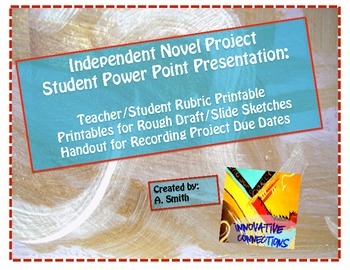 This novel project resource includes pre-writing/slide sketching sheets for the rough draft, a teacher/student rubric/checklist sheet, and student due date recording sheet with guidelines for presentation. Requirements include the major story elements (plot, setting, character, conflict, etc. ), persuasion tactics to sell the book, student opinion of book, etc.